KARACHI: Pakistan Peoples Party (PPP) chairman Bilawal Bhutto-Zardari on Tuesday said the government had responded to his demand to remove ministers whom he had accused of being associated with banned outfits by declaring him to be “anti-state, issuing death threats, and [National Accountability Bureau] NAB notices”. While addressing a press conference on March 13, the PPP chairman had demanded the removal of three federal ministers for allegedly being “supporters of banned groups” and having links with proscribed organisations. They [the PTI] are not taking action against the banned organisations because they had been their allies in the last general elections. The groups had been rebranded to help the PTI form its government,” Bilawal had alleged, calling for the formation of a joint parliamentary national security committee (NSC) with the mandate to oversee implementation of the National Action Plan (NAP). He also demanded that the PTI distance itself from the banned groups. The allegations came as the PPP’s senior leadership faced intensifying legal challenges in the form of a corruption inquiry involving fake bank accounts used to launder money, as well as a separate case involving fraudulent transfers of land in which Bilawal is one of the suspects. 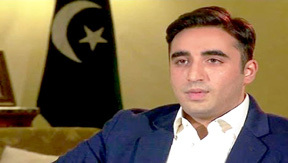 Bilawal had reiterated his demand for the removal of three ministers on Saturday while addressing the PPP’s Sindh leaders during a provincial council meeting.”None of this deters us from our principle stand,” he said today, reiterating his earlier demand that a joint NSC be formed and action be taken against banned outfits. The PPP chairman’s tweet came the same day as Finance Minister Asad Umar, while speaking to the media, regretted that Bilawal’s stance had been used by Indian media to score points against Pakistan. Umar recalled that after Bilawal had given his speech in Parliament, he had stood up and said that statements made by the PPP chairman would be used by India against Pakistan. Umar regretted that the next morning, the headlines of Indian newspapers and television programs said that “even Bilawal is saying Pakistan hides terrorists”. “Curse me as much as you want, but do not cause damage to Pakistan,” Umar said, apparently addressing Bilawal rejecting opposition’s allegations about proscribed organisations providing PTI support in the elections.